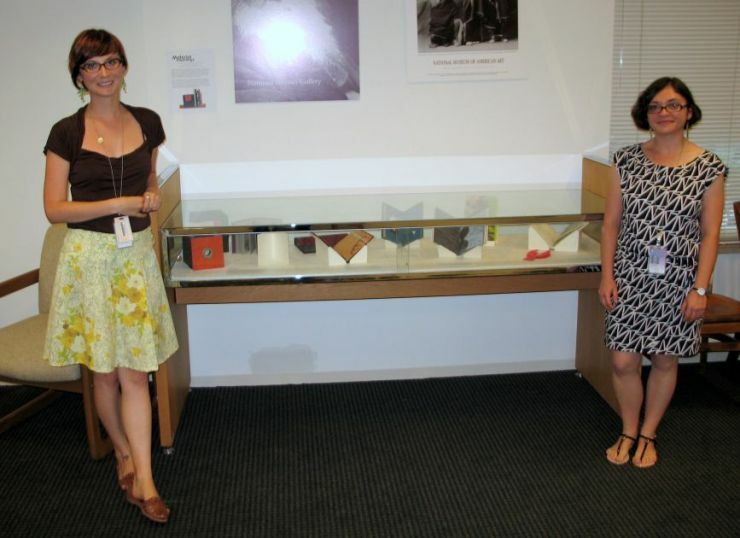 For the past two summers, the Hirshhorn Museum and Sculpture Garden Library (HMSG), the National Museum of African Art Library (NMAA), and the Smithsonian American Art Museum/National Portrait Gallery (AA/PG) Library have hosted graduate library student interns to work on the three libraries’ artists’ book collections. Each library has a history of collecting artists’ books with distinctly different goals. Books in the HMSG Library have been acquired to support the museum’s collection; artists’ books in NMAA were collected as examples of African art and those purchased for the AA/PG library have been obtained primarily for aesthetic reasons. Under the coordination of Anna Brooke (HMSG) and in partnership with Janet Stanley (NMAA) and Doug Litts (AA/PG), the internships were developed to define the issues regarding artists’ books in library collections and to determine ways to provide greater accessibility to them in the online catalog with the ultimate goal of providing more exposure to one of the Smithsonian Libraries’ many hidden collections. The 2011 internship addressed fundamental issues of defining artists’ books, surveying the three collections, and developing recommendations for enhanced cataloging. The internship also included field trips to many DC-area artist book collections, including the Library of Congress, the National Gallery of Art, the National Museum of Women in the Arts, and George Mason University. Amanda Meeks and Michelle Strizever were selected for the 2012 internship. Amanda is finishing up her MLS at Emporia State University and studied Book and Paper Arts. Michelle is also completing her MLS at the University of Maryland and for her Ph.D. in English from the University of Pennsylvania she wrote her dissertation on artists’ books. Amanda and Michelle carefully examined and researched several books from the collections and will soon be posting about them on the Smithsonian Libraries blog (such as this entry by Michelle). They also assembled a small exhibit of six books from the AA/PG collection that they found particularly interesting. On July 18, the AA/PG Library hosted an opening reception for the exhibit featuring these books as well as twelve others from the collection. 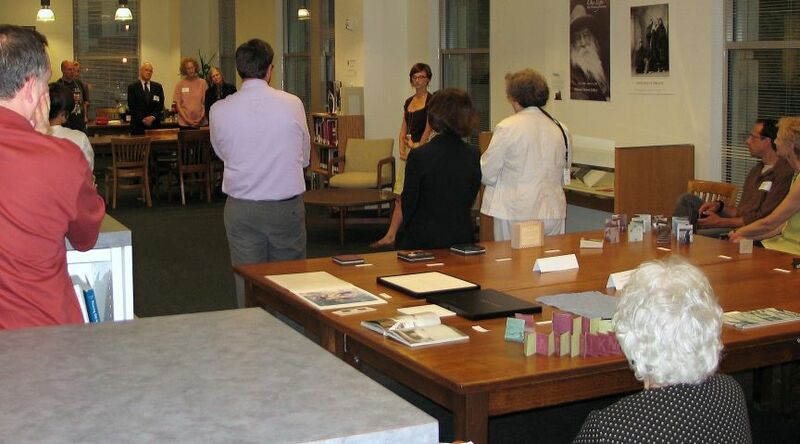 More than fifty attendees, including Smithsonian staff, local librarians, and book art enthusiasts, heard details about the ongoing project and examined the selections from the collection. Thanks to their diligent efforts and the enthusiastic response from our colleagues, the Smithsonian Libraries is looking forward to potential collaborative projects in the field of artists’ books. The exhibit is on view through the end of 2012. Information about visiting the AAPG Library is available here.